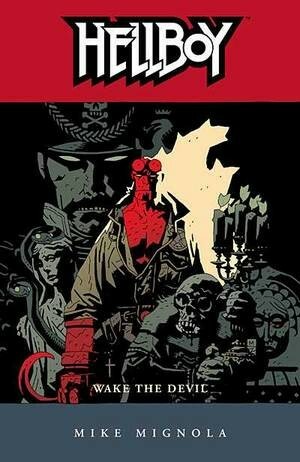 Mike Mignola’s love of gothic horror has spawned a distinctive line of successes in a self-contained universe, from the pulp excess of Lobster Johnson to the paranormal investigations of Hellboy. 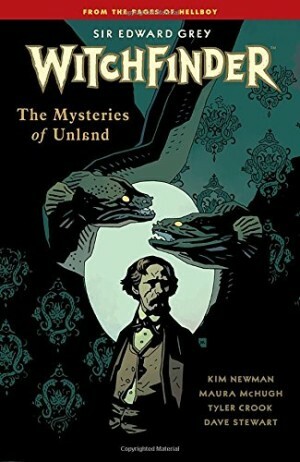 Witchfinder is to date the least well received of them. Existing in late 19th century London, Edward Grey’s fame rests on a case, supplied as a short story in the back of the book, where he prevented witches assassinating Queen Victoria. It provided him with a knighthood, a nickname, and a free-ranging brief to investigate what may be occult crimes. In this case it’s members of an archaeological expedition to what was believed to be a hidden city of Atlantis all dying, their bodies drained of blood. They’d returned to London bearing a strange skeleton that they eventually conclude to be cursed. Shortly thereafter Grey confronts a strange and feral creature, although not what we’ve been led to believe. Grey’s world is that of Victorian mysticism and spiritual belief. “Communing with the spirits, that’s your line isn’t it? Fortune-tellers and ghosts?” remarks one character. 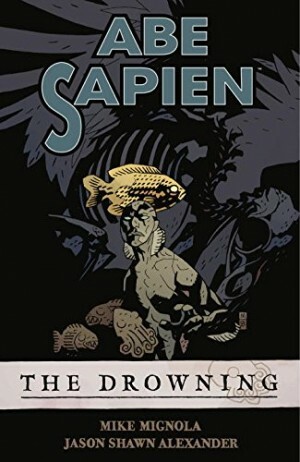 Mignola populates that world with characters who’ll be familiar to readers of other series he writes, creating a cohesive past for the longer-lived. There is precedent as Grey was introduced in Hellboy as a far older man. 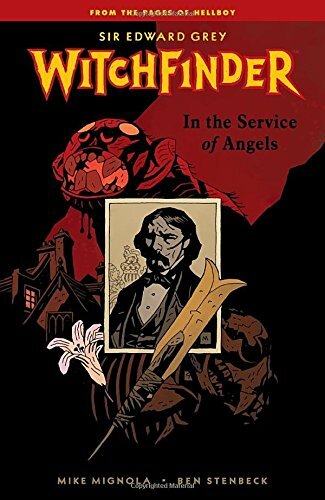 In the Service of Angels bears all the hallmarks of Mignola’s careful construction and design, and with Ben Stenbeck a very good artist is on board, but Grey never grabs the imagination. He’s dour and lacks charisma, and the constant narratice caption repetition of scriptural formality is dull, although Mignola’s diligence in locating suitable dialogue is impressive. It ranges from sources as diverse as Henry Purcell’s hymns, catholic exorcism ceremonies and historical magic incantations. 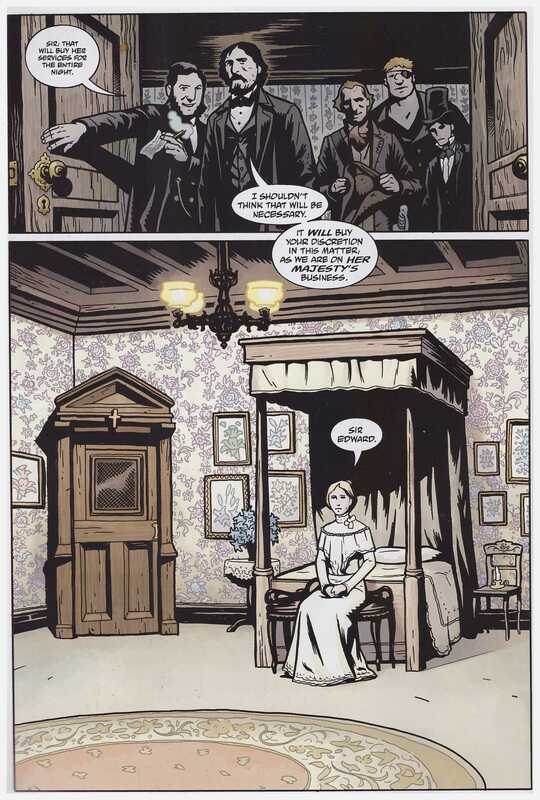 Stenbeck’s art, whether by inclination or instruction, is not too dissimilar to Mignola’s own, an impression heightened by the use of colourist Dave Stewart. Stenbeck has a good feel for period iconography, but his facial expressions are either stoic impassivity or startled, with very little in between, and that’s a weakness given the plot. It never conveys an emotional intensity. A further short story, ‘The Burial of Katherine Baker’ rounds off this collection, with the art of Patric Reynolds edging more towards the engraved detail of Guy Davis on the B.P.R.D. series. It’s a slight story of not suffering a witch to live. 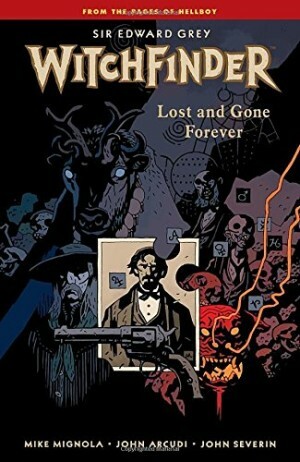 Witchfinder would return with Lost and Gone Forever.